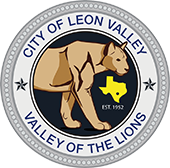 City Manager Kelly Kuenstler has declared Stage I drought restriction measures for the City of Leon Valley. Stage I water use reduction measures are declared to be in effect when the aquifer level at the J-17 well drops to six hundred sixty (660) feet above mean sea level (msl), based on a 10-day rolling average calculated and determined by the Edwards Aquifer Authority. All businesses and apartment complexes will use Wednesday as their watering day. (i) No person may use groundwater for an ornamental outdoor fountain or similar feature unless a variance has been obtained for 100 percent (100%) nonpotable water use. (ii) Owners of exempt Edwards formation wells must comply with these restrictions. (iii) Operators of athletic fields must submit a conservation plan to the city. Athletic fields may not irrigate between 11:00 a.m. and 7:00 p.m.
(iv) Residential washing of vehicles or other equipment is allowed only on assigned watering days and times. A hose with an automatic shut off nozzle or bucket of five gallons or less may be used. Water should not be allowed to run into the street. (v) Washing of impervious covers such as parking lots, driveways, streets or sidewalks is prohibited. (vi) Hand watering with a handheld hose, soaker hose, drip irrigation, bucket or watering can is permitted any time and any day. (vii) All nonpublic swimming pools must have a minimum of 25 percent of the surface area covered with evaporation screens when not in use. Inflatable pool toys or floating decorations may be used for this purpose. (viii) The use of commercial car wash facilities is allowed any day.